Eric Hobsbawm somewhere discusses one of the oddest conundrums in labour historiography, one paralleled now in the historiography of IS/SWP: the 20th century reputation of the Fabian Society as far-sighted pioneers of independent labour representation - the gap between what was and what is afterwards widely accepted as having been. Born in Trinidad in 1901, he was an agitator for West Indian and African independence, and an associate of the pioneering West Indian and African nationalists; organiser of black sharecroppers in the racist Deep South of the US; a militant in the US and British Trotskyist movement; a prominent mainstream Trinidadian politician in the late 50s and early 60s; a lone, aged prophet for the generation of black militants who became active in the 60s and 70s; and author of many books and articles on a wide range of subjects. Read more about Trotsky's widow broadcasts to the Russian workers, 1956: "New Regime of Lies—But Stalin's Old Methods"
This is a copy-edited and slightly expanded version of the printed text. Click here for the debate on Libya of which this is part. 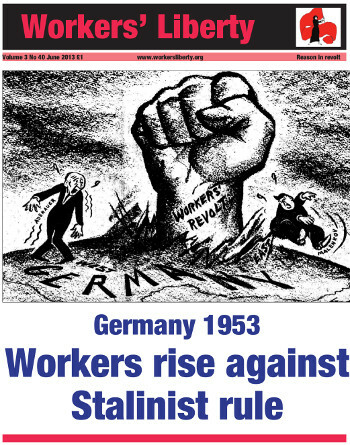 Click here to download the printed Workers' Liberty supplement as pdf. Click here to download the text, as slightly edited and expanded, in pdf format. The debate that follows occurred in the weekly paper of the Independent Socialist League of the USA, Labor Action, in January and April 1956. In the event of a war between Italy and France, which country would you favour? [Between 1949 and the death of Josef Stalin in 1953, the Stalinist press all over the world kept up a tremendous barrage of ant-Semitic "anti-Zionist" propaganda. By the time Stalin died, a show trial of 5 Jewish doctors accused of poisoning leaders of the USSR, was being prepared. Mass deportation of jews, or worse, would have followed the trial. Stalin died in March 1953 and his successors called off the trial and released the accused doctors. In 1956 Stalin's successor, Nikita Kruschev, put out an account of Stalin's ingrained anti-Semitism. Download pdf here or read online. 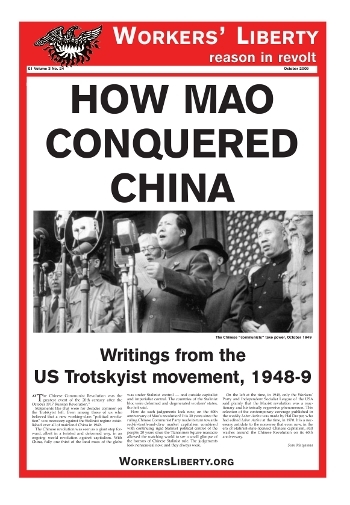 THE murder of Leon Trotsky culminated an epoch. It marked the end of the epoch of Old Bolsheviks, for Leon Trotsky was the lone survivor of that grand school of revolutionary Marxists. His murder at the same time was the final personal victory of Cain Stalin, and, if any more evidence was required, of the irrevocable counter-revolutionary degeneration of his bureaucracy in the Soviet Union and therewith the Communist International.